Let’s begin at the seaside with Grahame Greene. Imagine spending a wet Bank Holiday afternoon in Brighton and there’s a good chance you can already taste the atmosphere of damp, disappointment and danger that seeps through the films I want to tell you about. Graham Greene is important too. In the three years before World War II, he wrote A Gun for Sale, The Confidential Agent and Brighton Rock. All three are thrillers where there’s an attempt to bind the mechanics of a pulp plot to larger questions about fate and sin. Eccentric and desperate characters stumble through starkly atmospheric locations. Much of this is part of the template for all film noir – indeed A Gun For Sale became A Gun for Hire, with Alan Ladd and Veronica Lake. 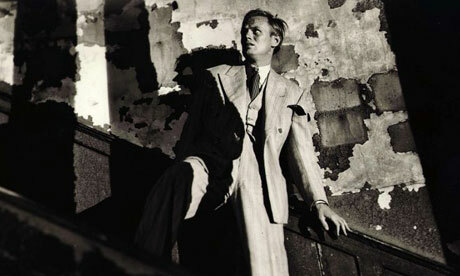 But Greene casts a long shadow over British noir in particular. When the Boulting Brothers made Brighton Rock in 1947 the Ealing Comedies they are most associated with today were still to come. Whatever the merits of those later films, they are rarely visually compelling – but Brighton Rock is as strikingly composed as the best noirs. Murder often brings out the best in directors , so let’s have a look at the demise of Spicer. Those off-kilter shot angles are a noir hallmark. But while a number of directors would probably shoot Pruitt and Pinkie from below like that, having Spicer’s body and that visually jarring spurt of flame reflected in the skylight above Pinkie is an original touch. I also like the subtle bit of reframing that goes on in the single-shot that takes us from Pinkie setting things up, to Dallow’s lizard-like observation of the scene, to the frail looking banister in the foreground as Spicer backs towards it. Incidentally, there’s a chance some of this came from Greene, who spoke about how Brighton Rock was the only time he wrote full shooting script that contained suggestions about shot sequences and camera positions. That rickety banister that gives out on Spicer tells us something about what makes British noir distinctive. It’s there in the character names as well, and Spicer’s forlorn desire to escape to The Blue Anchor in Nottingham. It’s not just that the milieu is British rather than American – it’s that this means that in place of Grittiness, we have Shabbiness. Perhaps it’s because the cities that dominate American noir are associated with modernity, whereas the places of British noir seem much older and sadder. So the running, desiring and dying happens against a backdrop of peeling paint, bombsites, draughty pubs and coal scuttles. In American noir, you die beneath neon lights; in British noir, it happens under flickering gas-lamps. In American noir, gin goes into martinis; in British noir, it goes into landladies. And there’s something delicious about watching well-known British actors plunge into this world and seeing what it does to them. For example, in Alberto Cavalcanti’s They Made Me A Fugitive, we witness Trevor ‘Brief Encounter’ Howard head-butting his way through a glass skylight, while in a vengeance-fuelled fury. I love the way the undertaker’s shop is used so exuberantly by Cavalcanti. The mise-en-scène is stuffed with objects that can act as both loomingly symbolic memento mori; and the sort of props that an enterprising set of villains can use for their own nefarious ends. The notion that a criminal gang could work out of a funeral home has a British mix of the bathetic and blackly comic about it. And that perhaps means that it is impossible to be too solemn about the film – although this does not stop it being by turns exciting, frightening and tragic. The idea of the shop as a strange corner of England, sheltering this gang of near grotesques, feels like it has grown from Dickens. And Dickens’s ghost does rattle at the windows of a lot of British noir. You can still smell that Dickensian atmosphere of comedy and threat in the streets and pubs of these films. Indeed it might be this vivid, slightly heightened reality that makes them so memorable, and saves them from the fate of some of the less distinctive American noirs, which can congeal in one’s memory into a black and white mass of tough guys and dames. There’s a great line in They Made Me a Fugitive when an old-crook who baulks at using a gun is told ‘Don’t get sentimental – this is the century of the common man’ and that, for me, captures the way something Victorian and melodramatic can be glimpsed, a little out of time but still not quite gone, inBritish noir. Which brings us to Night and the City, which looked at in some ways is the most American of these three films – it has an American director and two American stars. But the London it is set in is populated by characters like Fergus Chilk, a imperious lawyer whose sentences are punctuated by curt Yesses and Quites; Googin, a forger who talks in rhetorical questions; and Figler, who seems to be some sort of beggar administrator, and who at one point asks the protagonist Harry Fabian ‘Why don’t you settle down, get hold of a few good beggars and put ’em out on the street? I’ll give you all the supplies you need – legs, eyes, stumps…’ When you first encounter the film it feels like you have discovered that Dickens had to make ends meet by knocking up some B-movie scripts for Warner Brothers. In actual fact, much of this colourful detail is rooted in the original novel by Gerald Kersh, a London writer and so one almost inevitably influenced by Dickens. Kersh’s plots are grim and his sentences are red in tooth and claw but he is a romantic at heart. At first glance the script for the film bears little relation to Kersh’s novel – he is supposed to have said that the $40,000 he was paid for the rights to the book came out at $10,000 a word for the title, since that was all they retained. But when the title is as evocative as Night and the City, $10,000 a word may be about right. In any case the film still feels like Kersh to me. His first-hand knowledge of Soho is there in the tricks for gullling customers which Googie Withers teaches the girls who work in The Silver Fox. And his fatalistic romanticism can be seen in the way so many of the characters in the film meet their fates through striving hopelessly to grasp their hearts’ desires. Kersh’s sense of London as a mythic and elemental space also seems to me to be present in a climactic chase on a South Bank building site. Jean Cocteau wrote that London was ‘the town with healthy red cheeks and a heart of black coal’ and towards the end of Night and the City it seems like Harry Fabian has stumbled right into that black coal heart. He’s actually stumbling through the site of the upcoming Festival of Britain, so what is emerging is the first shoots of the landscape of concert halls and walkways that now defines that part of London. But on film, the stark landscape of rubble, towers and exposed walls feels like a place where the city itself is dying, or perhaps being reborn. Of course, to see affinities between these films is something that make more sense to us that it did to the people who made them. The term film noir was coined in 1946, but did not became part of critical discourse till the mid fifties and then mostly just in France. So it seems like few people thought of the films in those terms when they were being made – the people who were making them least of all. Dassin has said that he had no idea what film noir was when he made Night and the City. So I guess there is some question as to whether these films were a response to a set of American genre conventions, or whether they were influenced by the same mix of French poetic realism and German expressionism that fed American noir. Certainly Grahame Greene, during those mornings in the dark he spent as film-critic for The Spectator, expressed admiration for both Marcel Carné and Fritz Lang, both of whom probably exerted an influence over the style and milieu of Greene’s fiction and American noir. 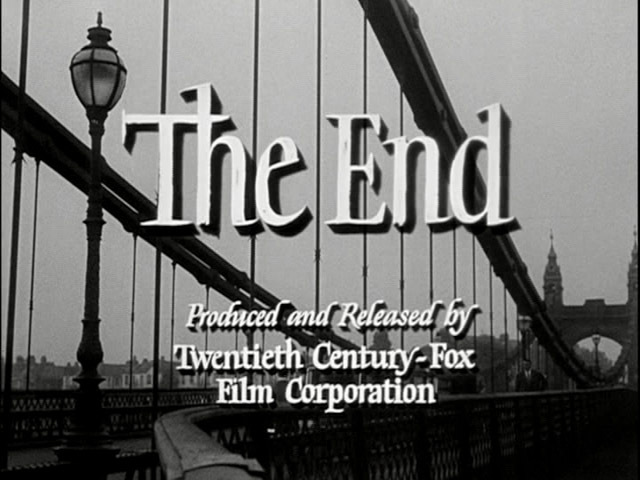 But at the same time, Brighton Rock was called Young Scarface in America, and Night and the City was recut in America (the American ending is actually better, and bleaker) and given a new score by Franz Waxmanm who scored Dark Passage, Sorry, Wrong Number and Sunset Blvd. which suggests that, if only commercially, the films were seen as having a place among those American films which were, at the time, probably called something like crime melodramas. 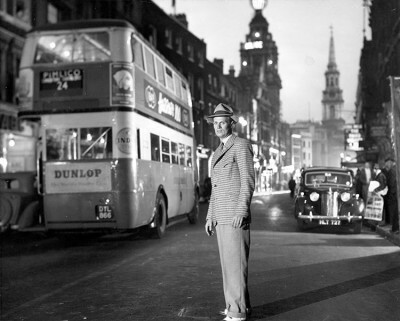 But for me there’s something magical that happens because of the Britishness of these films, they go to places that even the best American noirs, the classics every one talks about, rarely touch: of the three films I’ve written about here, only Out of the Past, Scarlet Street and possibly Laura linger in my mind in anything like the same way. Something happens when the secondary characters, so often reduced in the American films to a faceless parade of men who call each other Mac, Bud, or Mister, are instead lumpy-faced character actors calling each other things like Narcy (short for Narcissus), Mike Beer and Anna O’Leary. Watching these people can be as funny and sad as studying faces in an old London pub. And the desperation, paranoia and lust that runs through all noir is still there – but set loose in a world that is as old, dark, dangerous and cold as the Thames. Funny I was going to say the sane thing Veal. I think at one point, I thought about using Gibsons, as a more knowing sounding cocktail choice. But I got lucky because it was only after I’d written it down how the words ‘martinis’ and ‘landladies’ kind of have the same rhythm. “An extra dry landlady, Bud. And one for my companion.” You’re right!